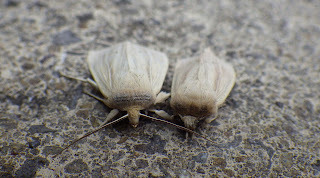 Rather unwisely (due to the strong northerly winds) I put out a couple of garden traps and two away-from-home actinics on Friday evening (30/6). I should have waited instead for Saturday night with its better conditions. 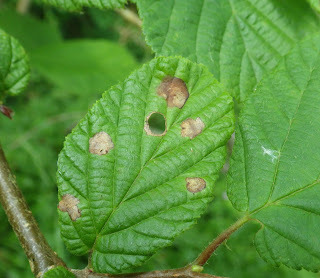 The two actinics were placed close to each other (but not inter-visible) in an area of riverside willows on the eastern side of Pwll. A dark sword-grass was a bit of a surprise (Adam Dare also had one on the same night at nearby Burry Port), but the rest were a quite mediocre bunch. Southern wainscots were in modest quantity (7). 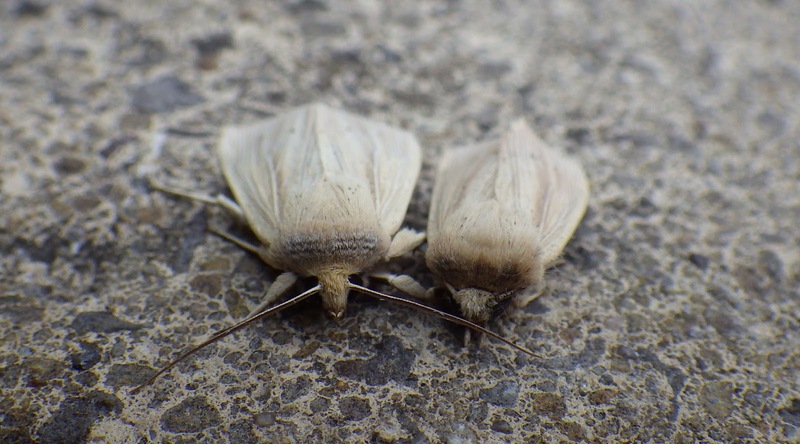 Above: two southern wainscots from the front, showing the forehead banding (a good i/d feature), especially on the left-hand moth; it is much more vague with the other moth (but it is there). When seen from above, the termen (corners) of the hind-wings are quite pointed. 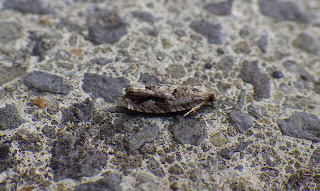 At the home trap, I had Epinotia signatana (the second time recently) and Mompha propinquella. Above: believed to be Epinotia signatana. 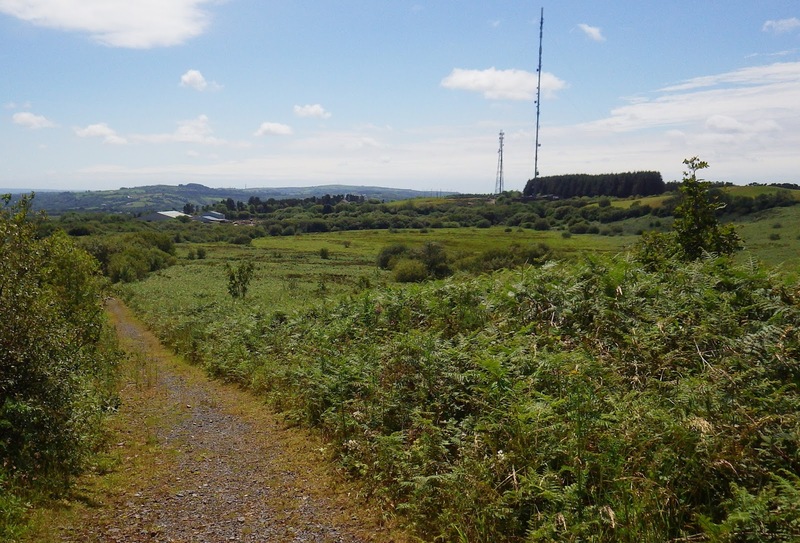 The next day (though I was feeling rather unwell and tired after a poor night`s sleep), I ventured to the eastern side of Carmel Woods, around Garregwenlais Quarry, intending to inspect open areas with thyme and marjoram etc, as well as the Clematis stands. At the latter I was hoping for pretty chalk carpet, which I`ve had there before. Though a few irritating clouded borders provided some false alarms, none were seen. The weather conditions - very blustery and sunny meant that most moths were keeping well under cover, so the inspection of the floriferous grassland was also a failure. Above: above Garregwenlais Quarry, looking approximately eastwards towards Mynydd Du. This SN61 part of Carmel Woods badly needs regular trapping and `dusking` of the open, floriferous areas as well as woodland, would yield good results. There could be some interesting micros to be had. Above: something has been eating the tips of Pulicaria, with this curious black `stuff` left behind. 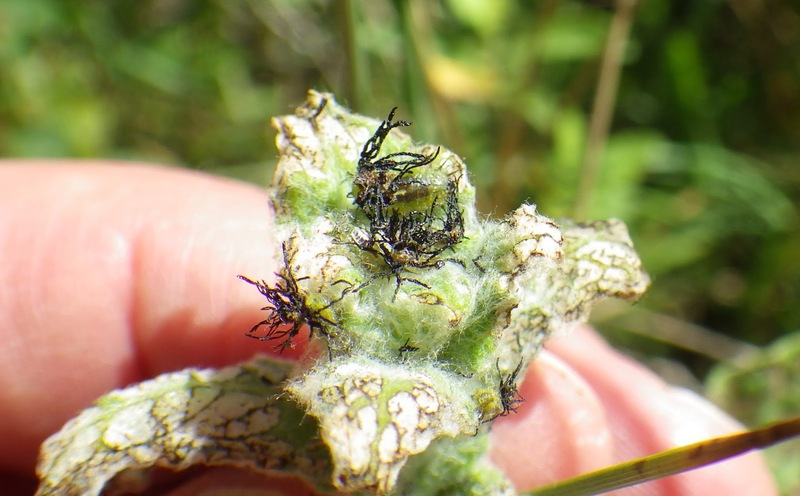 Various pyralids are to be found on this plant but beetles (chrysomelids or others) may also be a possibility. In the unlikely event of any suggestions, I`d be interested! Above: I spent some time searching in the woods for mines of the two scarce species of Mompha associated with Circaea, but found none. 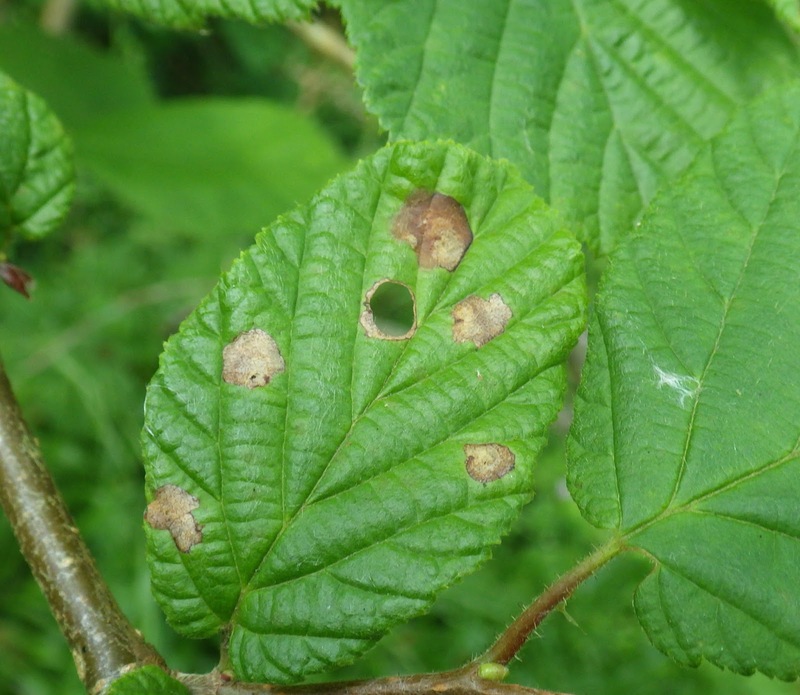 I did, however, spot these on hazel - Incurvaria pectinea? I then proceeded to the nearby Millstone Grit/quartzite ridge at `Cernydd Carmel` (near the cairns close to Garn-big) where I hoped to see Anania funebris at the only Carmarthenshire site where I`ve personally recorded it (several times since 2007). I saw two, the first quite low down the main trackway and a good distance from where I`ve seen others before. I was not anticipating it and my net was not `ready for action`. At this locality, I find them real blighters to catch - they have a sort of zig-zag, spirally flight and fly close to the vegetation which they quickly enter after very brief flights. Furthermore, the vegetation at this locality includes a lot of bramble shoots, as well as the food-plant, goldenrod. This meant that when I did see a second individual - and was ready for it this time - I failed to catch it; the blustery, strong wind did n`t help either and probably kept most moths deep down in the vegetation. I always am surprised how small this species is, though when you do get a good view they are exceedingly attractive moths which, with their black-and-white general coloration and yellow head-tufts, remind me of rockhopper penguins! 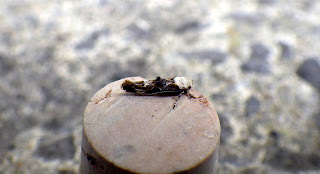 In 2007, I actually managed to catch one here and Jon Baker was then able to take a really good photograph (see Newsletter No 8, in the `Newsletter Archive` on the top R-hand side of the Carms Moth blogpage). Above: the track up to the cairns, looking downslope to the SSW, with the Carmel TV masts in the near distance. Anania funebris is mostly found alongside this track and I`ve also found colourful starwort caterpillars here in the past, but not for some years now. Another location that could do with some `dusking` on a still evening. Above: finally, some of the pyralid `grass-moth gang` can be tricky to i/d, but not this Catopria pinella, also trapped over the weekend. I think your Blastobasis is Mompha ochraceella Ian. 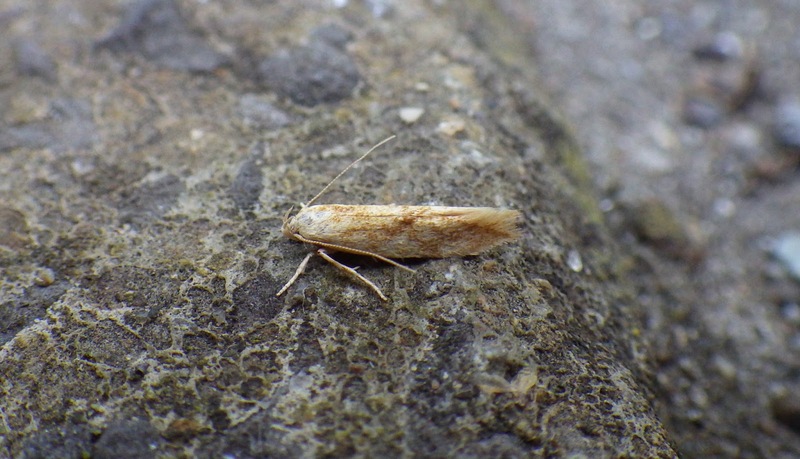 Paul, it looked a bit `arched` in profile and I did think that it may not be Blastobasis, but then I decided that it was and did n`t check further - but I was wrong. So thanks for the correction. 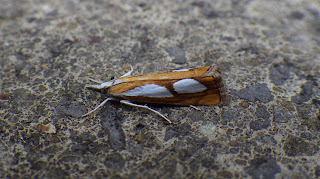 I did n`t think about ochraceella, even though I was actually on the Mompha page to check the propinquella. How daft can you get! PS - I`ll correct the text, adding `see comments`. The black stuff is attached to the tails of Fleabane Tortoise Beetle Cassida murraea larvae - look closer and you can see one of the spiny grubs below. Clever disguise! Thank you Barry! I had a suspicion that it was a chrysomelid. I see the adults (both green and orange colour forms) fairly regularly and some of the first ones I saw some 30+ years ago were at Erw-las, an area familiar to you. PS...yes, you can see a larva at the top!